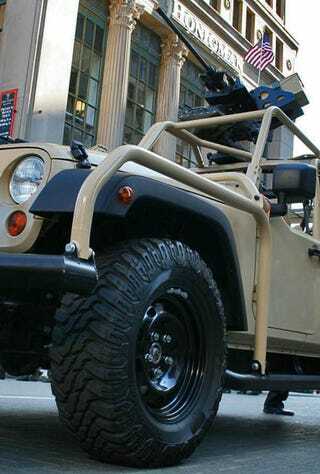 A pair of very cool Jeep J8's joined the fray in Detroit's Veterans Day Parade on Saturday, one bristling with weapons the other wearing an awesome hardtop. They also had news they'd be built soon in South Carolina. The J8's will be assembled by Jeep Government and Military Sales, which surprisingly isn't a Chrysler company, instead owned by parent company Jankel which is in the military and tactical vehicles business. The company has headquarters in both Surrey, UK and Duncan, South Carolina and that South Carolina part is important as they're planning to build the military spec beast down there. Currently the J8 is built as a knockdown kit in Toledo and shipped to Eqypt for final assembly and sales to foreign militaries (unless it's sent to AEV who sells them domestically). We weren't given a time line, but were assured it would be in the near future. We'll take the green one with the C-channel bumpers and awesome open-air hard top, the desert tan one with the weapons ring just seems a bit gaudy.